Shine is already the fourth album by Austrian epic bombast metal band Edenbridge, if you don't consider their live CD Livetime In Eden released earlier this year. Although I generally don't like traditional metal very much, Edenbridge have, since their debut Sunrise In Eden, always been part of my favourite bands. Their third CD Aphelion somehow gave the impression that Edenbridge would drive straight into a dead end street because there were not too many innovations. 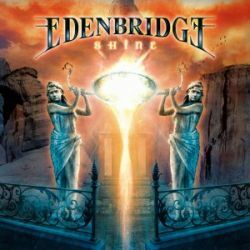 It seems that Edenbridge have found their way back with Shine, as they have done a remarkable effort, especially with the songwriting. The title track and opener is already so promising that you are in the mood to continue listening to this album. The following Move Along Home is my favourite track. This song has been veiled in a perfect melody and main man Lanvall occasionally shows that he knows to play the cither. Again no complaints can be done about singer Sabine Edelsbacher. She has meanwhile become the number one of female metal singers and parallels to that band from Finland that we don't need to mention here aren't necessary anymore. Shine is a mature and compact album that contains very different parts like ballads, up tempo songs, monumental stuff, Celtic tunes and even little operas: What You Leave Behind is quite close to Queen's The Show Must Go On. Not considering that little oops, this album has come at the right moment for Edenbridge to help them to breakthough.